The most successful coach and quarterback tandem in NFL history is without a doubt that of Bill Belichick and Tom Brady. To back up that declaration, the New England Patriots are about to participate in their ninth Super Bowl during the 18 years those two men have been paired together within that organization. In their previous eight appearances in professional football’s championship game their record is 5-3. While not quite as cut-and-dried as is the case in the NFL, the combination of Phil Jackson and Michael Jordan may very well be the greatest coach and player combination in NBA history. The two earned six championship rings together. In only three of their seasons while paired together with the Chicago Bulls organization did Jackson and Jordan fail to win a title. So which has been more responsible for the success enjoyed by the Patriots? Is Brady’s skill as a passer more important than Belichick’s scheming and leadership? It seems most likely that the actual answer is that both have made significant contributions to that success. The same can be said for Jordan and Jackson. While Jordan’s incredible ability on the hard wood was crucial, Jackson’s guidance of a team that contained a multitude unique personalities was essential. All that said, bring a similar type question to the realm of the Monster Energy NASCAR Cup Series. 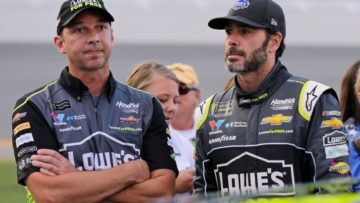 Driver Jimmie Johnson and crew chief Chad Knaus have worked together on the Hendrick Motorsports No. 48 team since its beginnings as a full-time effort in 2002. In that time they have earned seven NASCAR championships and made 83 trips to victory lanes all over the circuit including wins in the biggest events the sport has to offer. However, the Johnson/Knaus partnership is no more. As the 2018 season was entering its latter stages the announcement was made by HMS that this Dynamic Duo was being split apart at the end of the year. After suffering their first ever winless season together, the driver and crew chief that ushered the No. 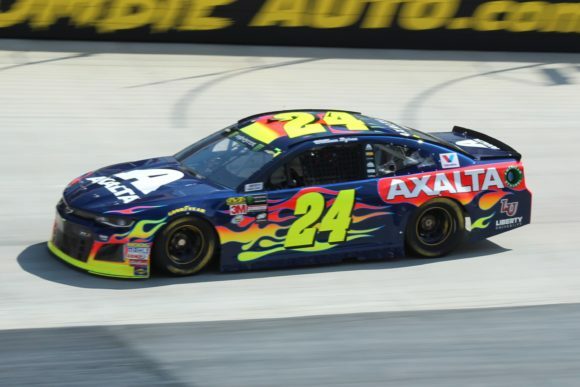 48 Chevrolet into the racing history books were being sent in different directions by the organization that has become synonymous with success in this form of motorsports. Kevin Meendering will move from the NASCAR Xfinity ranks as the leader of the crew that prepared cars for driver Elliott Sadler to head up the No. 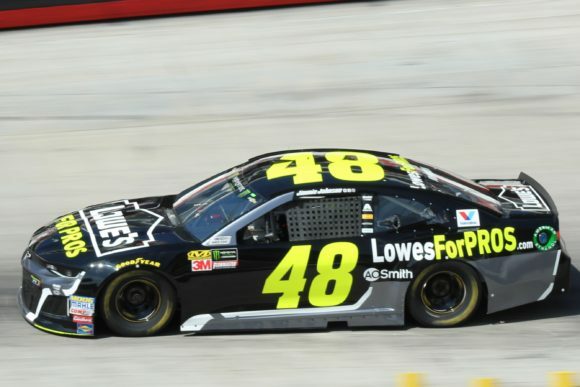 48 Cup Series team for Johnson in 2019. At the same time, Knaus will head up the No. 24 HMS operation for young William Byron. After a season in which only one Hendrick Motorsports team, that of Chase Elliott, won a race during 2018 it would seem to be a certainty that Herculean efforts are being made inside the shops located just minutes from Charlotte Motor Speedway to assure that such will not be the case again in the coming season. Of course, Johnson does not want to endure another winless campaign. Seven-time champions don’t get to be seven-time champions by simply sitting back and accepting their losses happily. And naturally, the same can be said of Knaus. Both men have shown themselves to be fierce competitors throughout their careers in NASCAR. But what if one finds success in 2019 and the other does not. No doubt social media will be awash with comments claiming that the one and not the other was most responsible for those previously earned wins and championships. If Johnson returns to his winning ways with Meendering atop the No. 48 pit box there will likely be some who will claim that the driver, not the crew chief, was most responsible for securing all those trophies. On the other hand, if Byron suddenly shows drastic improvement over what he did last season while Johnson struggles, the opposite will be said. Before he became Tom Brady’s coach, Belichick’s coaching had been somewhat unremarkable as he was even once fired by the Cleveland Browns. Even with that said, few would disagree that he has played a significant role in the success enjoyed by the Patriots over the past two decades. Jackson went on to win another five NBA titles without Jordan as he coached Kobe Bryant and Shaquille O’Neal with the Los Angeles Lakers. But no matter what, Belichick and Brady will always be paired together in the minds of many. The same can be said of Jackson and Jordan. In that same light, Jimmie Johnson and Chad Knaus will always be thought of as a pair. And considering that both are certain Hall of Fame members at some point in the future, that’s not necessarily a bad thing.